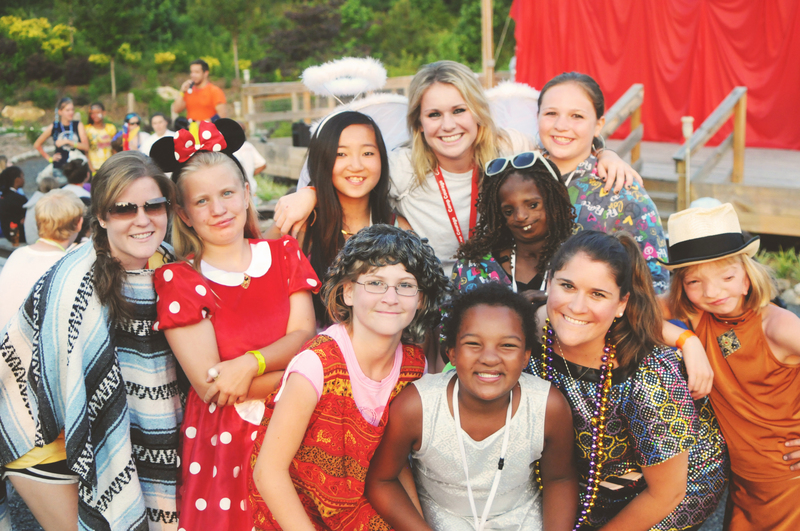 The Georgia locations of Taco Mac are proud supporters of Camp Twin Lakes, renowned for providing life-changing camp experiences for children with serious illnesses, disabilities and other challenges. Over the past 20 years, the company has raised an impressive $745,000 for the cause. 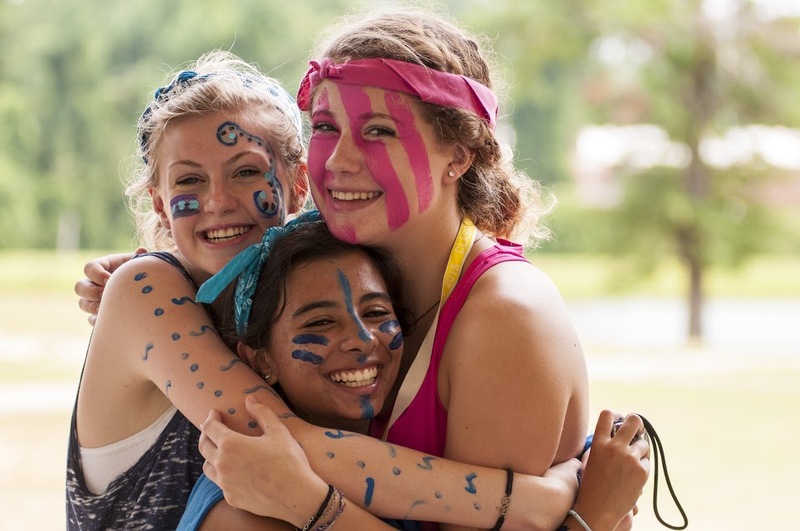 In 2017, Taco Mac donated 50 cents from each kids’ meal to the camp, and thanks to supportive parents and their hungry children, the company raised over $65,000 to send 138 kids to Camp Twin Lakes this summer. In addition to feeling good about helping a good cause, families dining at Taco Mac can also feel good about the great kids’ meals, which include favorites such as burgers, chicken and fish served with sides of fries or broccoli, along with juice and milk selections. In other news, the brand took home VIBE Vista awards for Best Beer Program and Best Responsible Alcohol Service from the 9th Annual VIBE Conference. Held in San Diego on Feb. 27, VIBE Conference, a hospitality brand of Questex. VIBE Vista Awards recognize positive initiatives that fuel beverage sales, innovations that contribute to operational efficiencies and training and service programs that lead to the highest quality standards and operational practices. Taco Mac CEO Greg Lippert is justifiably proud of the 2018 honors his company has received, which recognize the restaurant for its largest selection of ‘craft on draft’ beers in the Southeast, the popular Brewniversity program, which rewards customers with gifts and academic titles for expanding their beer knowledge, Beer of the Month and Theme Flight programs and special beer pairing dinners. Wednesday, March 28, is Day of Giving when Jersey Mike’s Subs will donate 100 percent of the days sales to charities across the country. 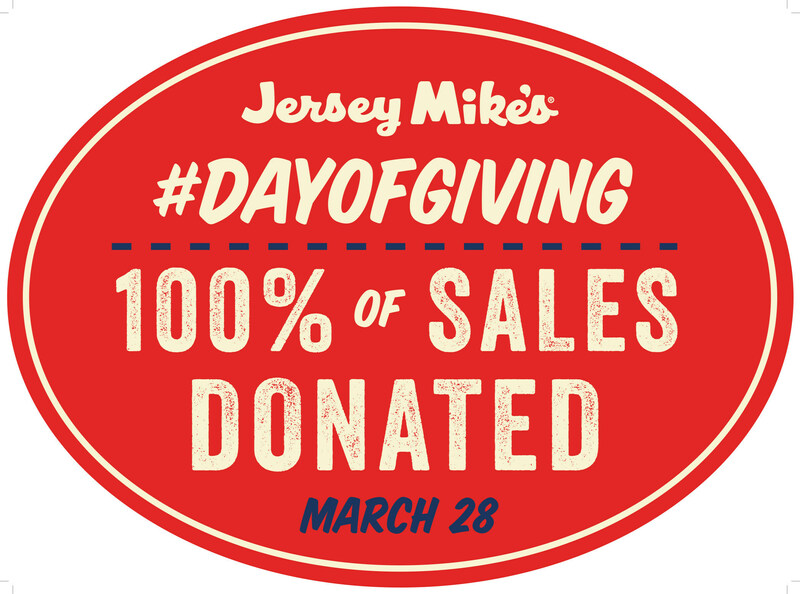 Day of Giving is the culmination of Jersey Mike’s Month of Giving fundraising campaign in March, supporting more than 170 local charities across the nation. Partners include hospitals, youth organizations, food banks and more. For more information about Jersey Mike’s Month of Giving, click here. RipplesTM, the marketing platform for dynamic customer engagement, unveiled its newest creation, Beer Ripples, top photo, which puts personalized content onto pints in seconds. 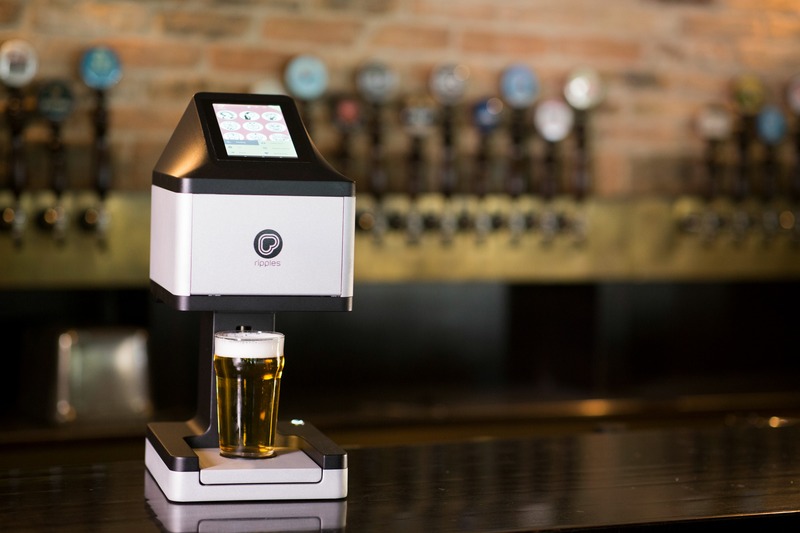 Designed to help bars, restaurants, clubs, hospitality owners and brands increase their engagement with their customers, Beer Ripples turns any foam-topped beer into a joyful and Instagramable moment using the latest 3D printing technology. Beer Ripples prints high-resolution images and messages at the touch of a button, using Ripples’ malt-based ink. The Wi-Fi connected, counter-top sized device features a highly intuitive and easy-to-use touchscreen system, making Ripples a highly convenient and versatile way to transform a simple drink into a one-of-a-kind experience that keeps customers coming back for more. No special training is needed to operate the device, and the opportunities for creating content are infinite, allowing any bartender, event host or server to add a special touch to any brew. Customers can even send a photo, personal image or message to the Beer Ripples through the Ripples mobile app. Ripples’ provides content/images from its library of hundreds of images and messages. New images are regularly uploaded in real-time to Ripple Makers around the world The free Ripples app, available on both iOS and Android, allows users to choose an existing image from Ripples’ content library or submit an image from their camera gallery to be printed on their drink. Beer Ripples is available now in the U.S. and Canada for $3,000 with an annual subscription fee of $1,500, which includes all consumables for up to 6,000 prints, customer service support and advice on best content practices. The system will be available globally soon. The Ziosk network, with tablets live in all 50 states and more than 55 million guests engaging on its screens per month, today announced the appointment of Barry Schliesmann as the Company’s Chief Product Officer. Mr. Schliesmann brings extensive technology leadership experience to Ziosk and will report directly to Jack Baum, chairman and chief executive officer. In his role, Schliesmann will be responsible for leading product strategy and development. Prior to Ziosk, Schliesmann held the position of Chief Product Officer at Thales InFlyt Entertainment and Connectivity where he defined, architected and implemented the Company’s product strategy and roadmap. There he defined and delivered next generation “at home in the air” quality connectivity and entertainment solutions. Give Something Back and Do The Right Thing are two core values important to The Wendy’s Company, and employees live these values in a variety of ways. Each year, Wendy’s recognizes employees and all they do to make a positive impact in their communities through its Community Ambassador Grant Program. Ten Wendy’s employees are recognized for exemplary volunteer efforts in their communities with a $2,500 grant to an organization they support with their time, talents, and resources. The Community Ambassador of the Year is selected from this group and awarded an additional $10,000 grant for their organization. 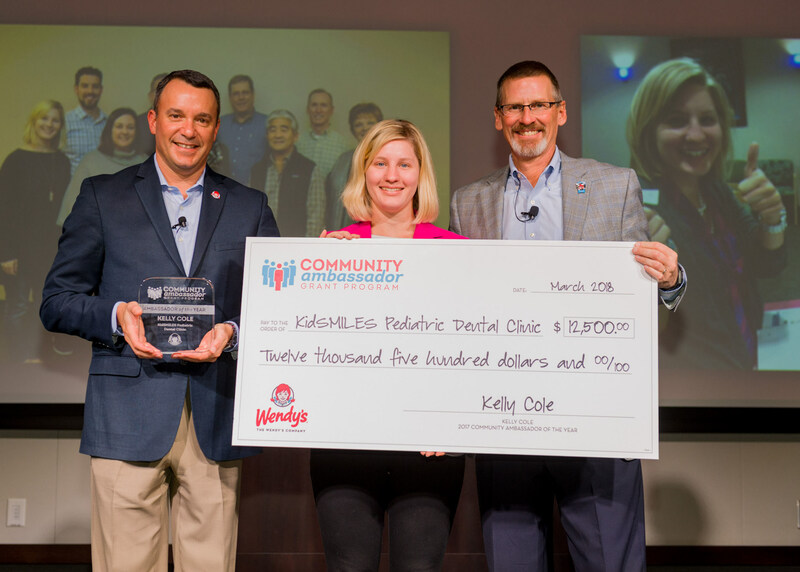 Kelly Cole, Senior Financial Analyst at Wendy’s Restaurant Support Center, has been named Wendy’s 2017 Ambassador of the Year for her six-year involvement and leadership role with KidSMILES Pediatric Dental Clinic in Columbus, Ohio. Kelly Cole supporting KidSMILES Pediatric Dental Clinic, Columbus, OH (Community Ambassador of the Year) – Kelly became involved with KidSMILES, a non-profit dental clinic dedicated to providing quality dental care and education to children at an affordable cost, in 2011 as a fundraiser organizer. Kelly has organized silent auctions, football tailgate fundraisers, and an annual 5K race to benefit the clinic. In 2017, Kelly was voted to the Board of Directors as Treasurer, and her responsibilities include protecting the organization’s financial resources by assuring proper maintenance of financial records, overseeing the integrity of the financial control systems, providing financial information for an annual external audit, and working closely with the finance committee and staff members on fiscal matters. Kelly believes that every child deserves to have a beautiful smile, and thanks to her dedication to KidSMILES, the clinic was able to provide nearly 600 dental appointments in 2017. Wendys Community Ambassador of the Year, Kelly Cole (middle), with Chief People Officer Coley OBrien (left) and President and CEO Todd Penegor (right). William Portney supporting Lakeland Fire Department, Ronkonkoma, NY – William is a 23-year supporter of the Lakeland Fire Department and continues to dedicate 20 hours a week to the department. He is a qualified ambulance driver and scuba diver, was honored as Firefighter of the Year, and has been repeatedly recognized as the department’s most active member. Lakeland Fire Department plans to use the Community Ambassador grant to provide specialization training for other department volunteers. Julia Larkins-Monahan supporting Run Down the Demons, Columbus, OH – Julia became involved with Run Down the Demons four years ago when her son founded the organization to support soldiers who return from war and suffer from PTSD. Julia has used her project planning skills to organize fundraising events, which are crucial for PTSD research. With Julia’s help, Run Down the Demons donated $30,000 to the College of Social Work at the Ohio State University in 2017 to develop a new course for social workers to better support those suffering from PTSD. Alexis England supporting Pittsburgh Rotary Club, Pittsburgh, PA – The daughter of a former Rotary Club President, Alexis was introduced to Rotary at a young age. Alexis has served on the Pittsburgh Rotary Club Board of Directors and was recognized by Rotary International as a “40 under 40” member for her regional and international philanthropic work. She has served as the Shoes for Nicaragua Committee Chair for five years, where she led efforts to collect school shoes for children in Nicaragua. Additionally, Alexis’s efforts in networking and soliciting have aided the Club to raise enough money to open a third free medical clinic in Nicaragua. Alyssa Creatore supporting LifeTown, New Albany, OH – Alyssa was first introduced to LifeTown three years ago through Wendy’s employee volunteer program. For the last two years, Alyssa has participated in the LifeTown Mentoring Program, which matches students with special needs from Columbus City middle and high schools with business professionals to build job seeking skills. Alyssa has recruited three additional Wendy’s employees to participate in the Mentoring Program and has built and maintained a trusting relationship with her mentees. Tim Enos supporting Dartmouth School Music Association, Dartmouth, MA – An active member of the Association since 1988, Tim believes it’s important to keep the arts alive in our school systems and that music teaches important life skills such as teamwork, planning, friendly competition, and work ethic. Tim currently serves on the Executive Board as Ways and Means Chair and volunteers as the concessions organizer and prop coordinator for the school’s indoor percussion program. With support from the Music Association, the Dartmouth High School Marching Band won back to back national titles in 2016 and 2017 and the color guard program placed second in their division at the World Guard International Championships in 2017. Melissa Stanton supporting Kaleidoscope Youth Center, Columbus, OH – Melissa was introduced to Kaleidoscope Youth Center, a safe place for LGBTQ+ youth to be themselves, in 2009 and became an active volunteer in 2015. Melissa volunteers at KYC every Monday to assist with youth programming, and she’s currently working with the staff to develop an annual fundraiser, Sister Christmas. Funds raised from Sister Christmas will provide KYC youth with items such as job interview clothing, technology for education, or any other need identified by a youth to better their true selves. Clark Elms supporting The Human Impact, Dallas, TX –The Human Impact’s mission is to create a space for the homeless, formerly homeless, and other community members to experience life together. Introduced to the organization by his daughter, Clark has supported the charity by sponsoring members of the Dallas homeless community to help them get back on their feet. Clark has driven individuals to rehab appointments, helped individuals save money, and at times, welcomed them into his home where he provided a safe place to stay. Clark is committed to providing support and resources to those in need. Ashley Sperling supporting Samaritan’s Purse, Atlanta, GA – After learning about Samaritan’s Purse from a Wendy’s franchisee, Ashley has been involved in the organization’s Operation Christmas Child program for eight years. Each fall, Ashley and her daughter prepare shoeboxes filled with toys, school supplies, and personal items and ship them to need-based countries. Together they have shipped over 500 shoeboxes. Ashley believes the experience is teaching her daughter the importance of giving back and lessons in being kind and humble. Cathy Lewandowski supporting Heart of Ohio Ferret Association, Columbus, OH – Cathy became involved with the Heart of Ohio Ferret Association (HOFA) in 2015 after she adopted a pair of ferrets as her pets. Cathy’s primary role with the organization is as a foster parent, and she has cared for ferrets who have been neglected or need extra care before being placed for adoption. Over the past year, Cathy has assisted in placing five foster ferrets in a forever home. In addition to fostering, Cathy has also volunteered for the organization’s annual Buckeye Bash, which is one of the largest ferret shows in the country, and has organized public outreach events to spread awareness about HOFA. 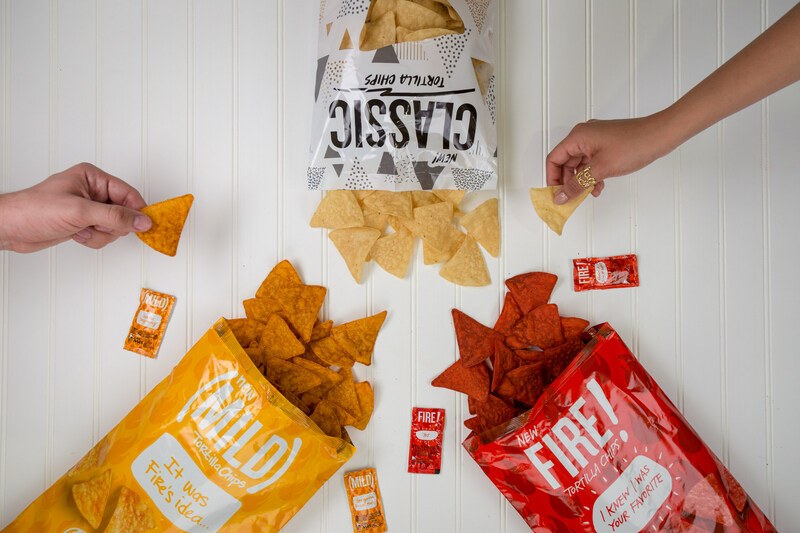 Taco Bell is making it even easier for fans to connect with the nation’s leading Mexican-inspired restaurant brand by bringing them the Taco Bell flavors they crave at home, on the go or when upping their chip and dip game for their next party. Beginning this May, Taco Bell tortilla chips are rolling out to grocery and convenience stores. Loews Philadelphia Hotel, the home of the Nation’s first skyscraper and PSFS building has promoted chef Tom Harkins to executive chef overseeing all facets of the hotel’s culinary operations. Chef Harkins tenure at the hotel began in 2005 as chef de cuisine. He opened Bank & Bourbon, a 220-seat rustic inherently American style restaurant in 2014, leading his team of 24 to create a menu of contemporary dishes, while honoring the simplicity of the ingredients. His connection to creating updated American classics, comes from his own passion and love of developing flavors that blend the familiar with the unexpected. Prior to joining the Loews Philadelphia team, Harkins’ culinary resume includes more than 20 years of experience in positions such as chef de cuisine at top Zagat-rated restaurants. He has worked in the kitchen of Olivier de St. Martin, then executive chef of the acclaimed Founders at Philadelphia’s Hotel Atop the Bellevue. He moved quickly from gourmet cook to sous chef to chef de cuisine. In 1993, he decided he wanted to run Restaurant 210 at the AAA Five Diamond Rittenhouse Hotel. During his tenure, the restaurant received the Distinguished Restaurant Award by Conde Nast Travelerand Zagat named it “Best Continental Restaurant” in the City. Chef Harkins graduated from the Culinary Institute of America and is a native Philadelphian. Hyatt Regency Waikiki Beach Resort and Spa’s General Manager Doug Sears announces the appointment of Jeffrey Szombaty as Executive Chef and the timely debut of The Buffet at Hyatt. With close to two decades of experience in the hospitality industry, Szombaty joins the resort from Hyatt Regency Vancouver, where he served as Executive Chef for three years. Before his move to British Columbia, Szombaty served as Executive Sous Chef at Hyatt Regency Waikiki from 2010 to 2014. In his new role, Chef Szombaty has spearheaded the resort’s newest venue, The Buffet at Hyatt. With a focus on sustainability and delicious, organic options only available in Hawaii, The Buffet will be available from 5:30pm – 9:30pm nightly on the third floor of Diamond Head Tower. Menu highlights include a made-to-order poke station and sushi, Kauai shrimp, fresh local fish, kiawe smoked alaea salt crusted prime rib, southern king crab legs with Hyatt’s famous Singaporean chili crab sauce, certified angus grilled beef, traditional Hawaiian specialties, extravagant dessert selections, and more, with gluten free and vegetarian options throughout and an expanded seafood selection on weekends. A New Jersey native, Szombaty began his culinary career early in life, working in professional kitchens starting at age 16. He first joined the Hyatt community in 2000 as a Cook at the Hyatt Regency at Penn’s Landing in Philadelphia, PA. He moved up the ranks to Banquet Chef in 2007 and transferred to the Hyatt Regency McCormick Place in Chicago in that same role in 2008. 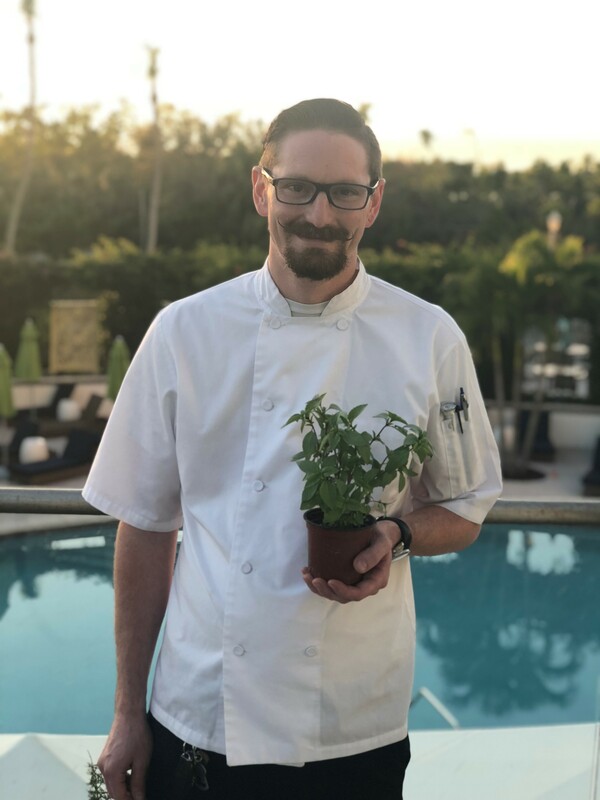 It was from Chicago that Szombaty moved to Waikiki to work as Executive Sous Chef under Sven Ulrich, and it is with great excitement that he is welcomed back to the resort. Naples Grande Beach Resort appointed Andy Philips as the Restaurant Chef of the newly reimagined signature restaurant, The Catch of the Pelican. With an array of new menu items, Chef Philips will be spearheading the operations of the restaurant after the property’s recent post-Hurricane Irma reopening. A graduate of the Art Institute of San Diego, his culinary arts expertise spans across multiple cultures and genres, including New American, Asian Fusion and farm-to-table. With his west coast training in the art of all things seafood, he will make an excellent addition to the culinary team at Naples Grande. Chef Philips will be working at the newly refreshed The Catch of The Pelican alongside the restaurant’s newly appointed general manager, Marcus Thompson. Marcus has a range of experience in food management as a former Managing Partner of Outback Steakhouse. He has also previously served as General Manager for UNOs Chicago Grill and Boston-based waterfront restaurant, The Barking Crab. He recently debuted a variety of fresh new offerings on the Florida-inspired menu including the Island Shrimp Bowl with coconut rice, jerk flavors and fresh mango; a Truffle & Artichoke Pimento Cheese Dip; and Local Florida Catch, featuring the freshest local seafood that Chef Andy can source, paired with his local farm vegetables, and homemade chipotle blue cheese butter. Chef Andy also assisted with conceptualizing the newly debuted Bar Bites Menu, featuring the savory Fried Brussel Sprouts, refreshing Beets and Goat Cheese and Fire Cracker Wings. 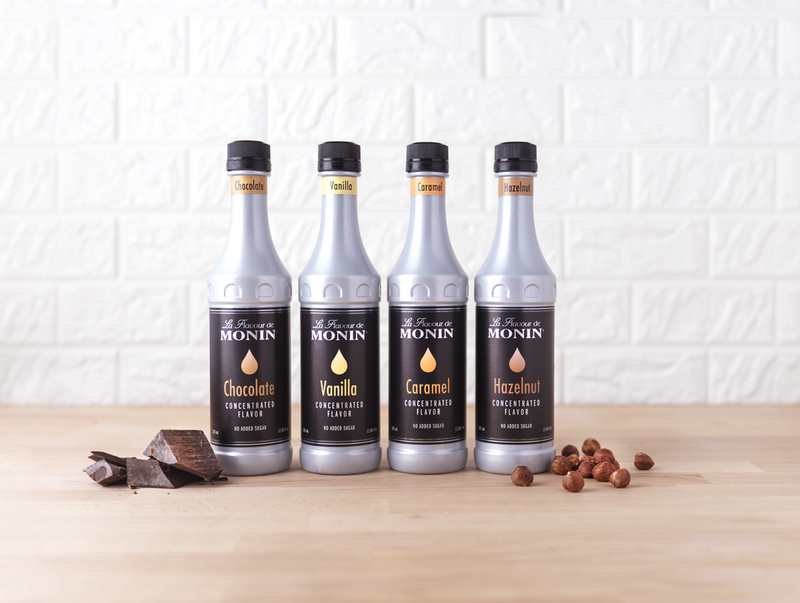 Monin’s introduced its Cafe Collection, concentrated flavor for both coffee and cocktail beverages, creating an indulgent experience without any added sugar or artificial ingredients. Baristas and bartenders can easily enhance specialty drinks with this variety of all-natural, highly concentrated flavors – now available in Chocolate, Vanilla, Caramel and Hazelnut. Monin Concentrated Flavor contains no artificial ingredients plus are gluten-free, GMO-free and vegan, part of the company’s commitment to offering clean label products. The collection adds a hint of low-calorie flavor that can be paired together or layered with other syrups or sauces. Plus, coffee patrons can now have flavor without sweetness allowing them to choose their preferred sweetener for an entirely personalized experience. Einstein Bros.® Bagels released a new line of Cheesy Shampoo and Wakin’ Bacon Conditioner, giving breakfast enthusiasts an entirely new way to incorporate their love for cheese and bacon into their morning routines. 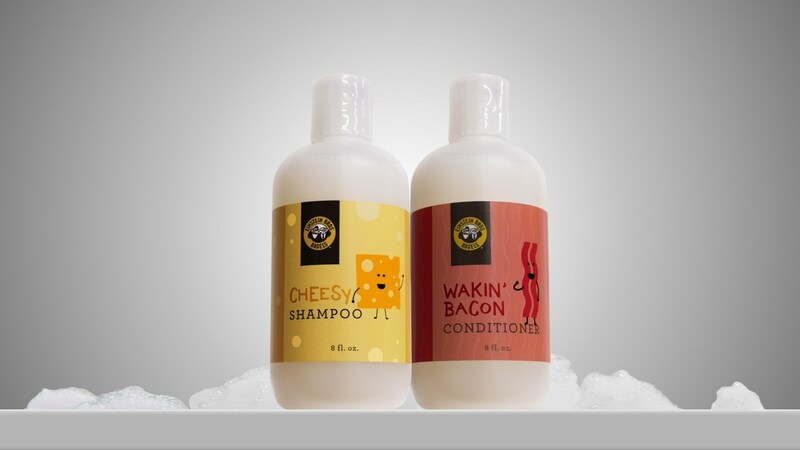 Consumers can purchase the set of shampoo and conditioner, inspired by Einstein Bros.® Bagels’ limited-time Cheesy Wakin’ Bacon sandwich menu offering. The duo is available for $9.99 while supplies last. Einstein Bros. Bagels’ Cheesy Wakin’ Bacon sandwich is made with thick-cut, nitrate-free bacon, cage-free eggs and cheddar served on a six-cheese gourmet bagel. Other limited-time menu offerings include the No Yolk, made with cage-free egg whites, turkey-bacon, tomato, avocado and roasted tomato spread on an ancient grain Thintastic bagel and the SuperNova with lox, avocado, tomato, cucumber, red onion, capers and onion & chive shmear served on a sesame bagel. All are available at participating stores through May 2. Philip Rubino has been appointed chef de cuisine of lively all-day Hollywood eatery Jane Q. Bringing 10 years of culinary experience to the Beachwood Canyon restaurant, Rubino will collaborate with Executive Chef Bryan Podgorski, working to continually evolve Jane Q’s seasonal menu of farm-fresh breakfasts, house-made pastries, rustic Californian dinners and indulgent desserts. Additionally, Dan Rook has been promoted from Lead Bartender to Beverage Manager of The Kimpton Everly Hotel. In this new role, he will oversee menu direction and all beverage operations for Jane Q, Ever Bar, and the hotel’s catering and in-room dining. Chicago native Rubino began his career at his family’s bakery, later attending culinary school at Illinois Institute of Art. Starting as a line cook at Chicago’s acclaimed BIN 36, he worked his way up to sous chef, followed by tenures at Spiaggia and A Mano. In 2008, he played an instrumental role in helping Chef Laurent Gras achieve three Michelin stars at L2O. He continued honing his skills at BIN Wine Café, Café des Architects, Acadia, and as executive chef at Moderno. Accolades include the 2013 recognition of “Rising Star Chef” nominee by Jean Banchet’s awards for culinary excellence. Rubino was also integral to the high-profile team that launched Chicago’s critically acclaimed Cicchetti. Also hailing from Chicago, newly appointed Beverage Manager Rook is a Kimpton Restaurants veteran, with the company moving him from his post as Lead Bartender at Kimpton’s South Water Kitchen to Los Angeles in 2017 to helm the bar programs for Jane Q and Ever Bar. Since the restaurant and bar duo opened last August, Rook’s inventive cocktail menus have earned both local and national acclaim, with Ever Bar voted “Best New Bar” in L.A. Weekly’s Readers’ Choice Awards in 2017. Recently, his Academy Awards-themed cocktail menu drew widespread local interest and cemented Ever Bar’s status as one of the most creative cocktail programs in the city. He was previously named “Best Bartender of the Year 2015” by the Chicago Tribune’s Redeye and named to Zagat’s “30 Under 30 List” in the same year. New Pig Corporation, the leader in helping facilities create cleaner, safer and more productive environments, introduces PIG Grippy Carpeted Entrance Mat, the world’s first adhesive-backed carpeted mat. This latest addition to the Grippy Mat product line designed to provide a stylish new solution to risky and outdated rubber-backed entrance mats that shift, slide and create tripping hazards. Grippy Carpeted Entrance Mat is available in two textures and four colors to complement any modern or upscale environment. The quick-drying carpet top, made from 100 percent postconsumer recycled content, features high-performance, colorfast fibers that resist stains and fading. A low-profile surface design traps dirt, debris, sand and liquids while helping the mat look cleaner, longer. And with crush-resistant, commercial-grade durability, the mat can stay in place for three to six months, depending on conditions. Like all Grippy Mats, adhesive-backed Grippy Carpeted Mat stays put with no bunching, shifting, rippling, curling or flipping over. The mat’s proprietary adhesive backing delivers the ideal balance of stick-and-release performance to keep it in place, but peels up easily without leaving residue when it’s time to replace it. The adhesive backing also allows Grippy Carpeted Mat to be cleaned in place with a vacuum or water extractor, eliminating the hassle of dragging heavy mats around. Grippy Carpeted Mat rolls out for continuous walk-off coverage with no gaps, ripples or overlaps that cause slips and trips. And since the mat cuts easily without fraying or unraveling, it can be used to create custom sizes and shapes around beams, corners and asymmetrical floor layouts. Grippy Carpeted Mat is ADA compliant for wheelchairs and walkers and has been tested and certified by the National Floor Safety Institute (NFSI) as a high-traction surface. 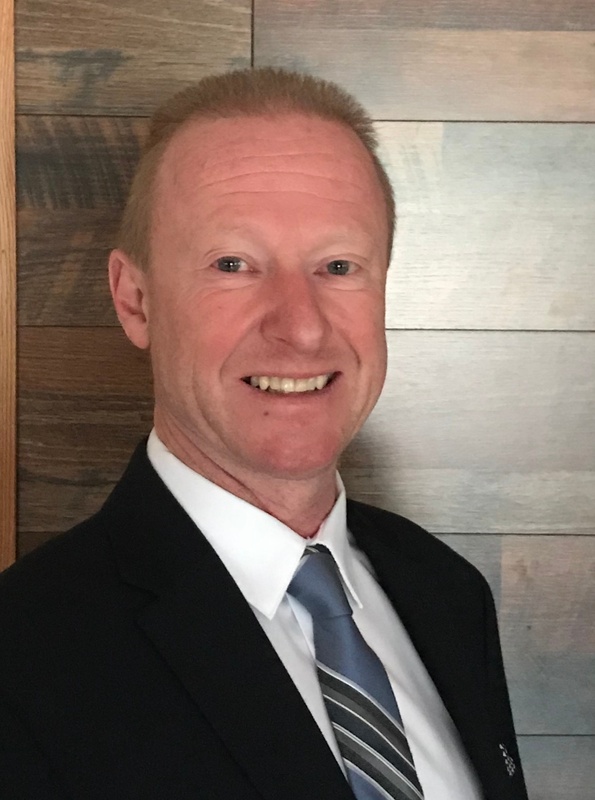 APG Cash Drawer, a global manufacturer of cash management solutions added Nigel Ball to the role of Vice President of Sales in North America. In this role, Ball will lead and oversee all functions of APG’s core product sales activities in North America. Based in Kenosha Wisconsin, Balll brings more than 35 years of experience with expertise in creating and executing global sales and strategies, managing P&L, developing new business, coaching and mentoring teams, as well as building long-term customer relationships. 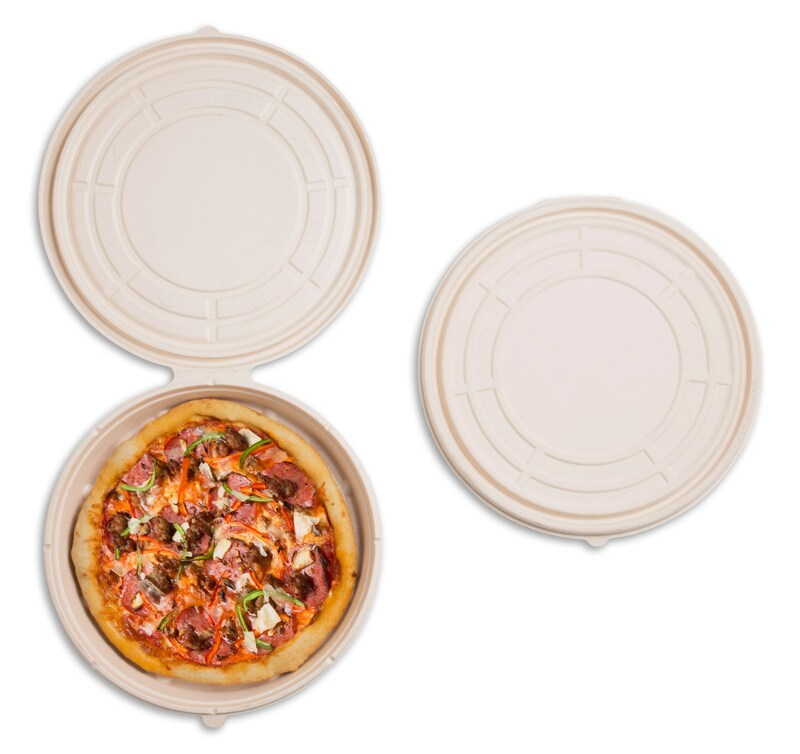 World Centric introduced Pizza Round, the 100 percent tree-free, plant-based, compostable pizza container for pizza takeout/delivery restaurants. The breakthrough circular container reduces packaging waste, labor and space needs as well as grease and sogginess that are common with traditional cardboard pizza boxes. Made from 80 percent sugarcane and 20 percent bamboo – both renewable resources – the PizzaRound offers key sustainability advantages that support restaurants’ efforts to minimize their environmental impact. The PizzaRound is currently available for 12″ and 14″ pizzas, with a 16″ size to be added later this year. Custom imprinting is also available. 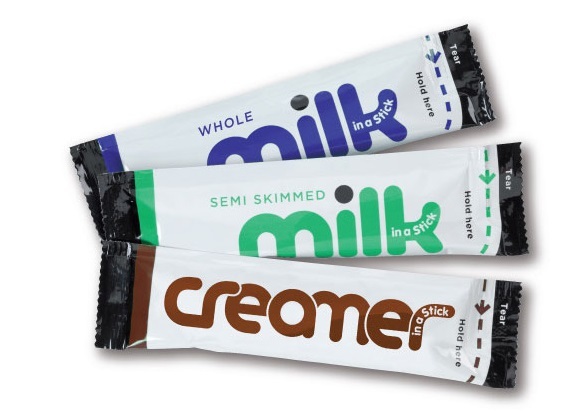 Diamond Crystal Brands’ is distributing Milk in a Stick from Lakeland Dairies. Minimal storage footprint. The sleek, slender design and strong, flexible packaging offers 50 percent space savings in the front and back-of-the-house, better environmental advantages, lower distribution costs and less fuel to transport. MobileBytes introduces Slate, its original Point of Sale enclosure. Designed and engineered by Heckler Design of Phoenix, the sleek, powder coated steel stand has no visible screw heads, fasteners or holes, and accommodates two iPad sizes. “Slate 9” fits a standard 9.7 inch iPad and “Slate 12”, fits the 12.9 inch iPad Pro. Slate is simple to assemble, clean, and maintain. A premium positioning hinge allows a user to set and hold the optimum viewing angle of the enclosed iPad, providing a superior user experience regardless of counter height. 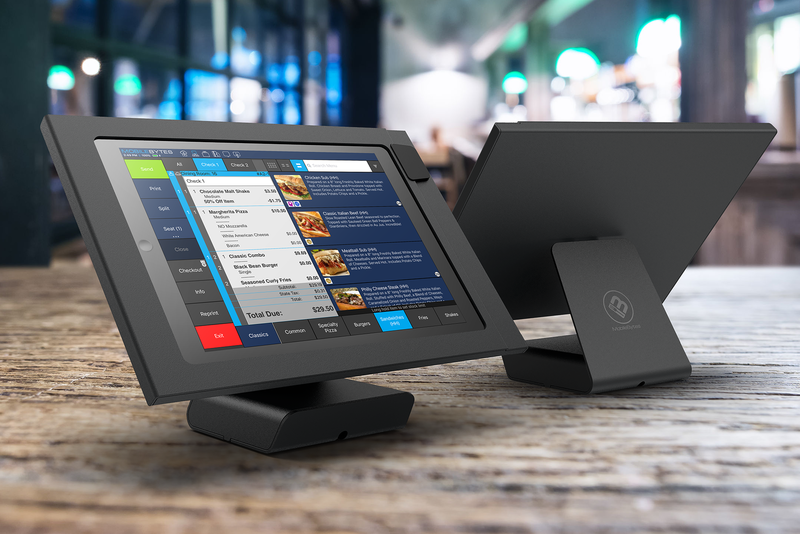 The hinge also allows rotation greater than 100 degrees giving merchants the ability to flip the iPad toward the guest for signature capture. The Slate enclosure can be mounted to countertops, display arms and floor stands. Slate was custom built to support the Gigabit + PoE Adapter from Redpark of Emeryville CA. This revolutionary adapter provides both power and Ethernet connectivity to an iPad through a single Cat-6 cable exiting Slate through a small hole in the base. This eliminates unsightly cabling associated with existing Ethernet solutions for iPad. Slate comes configured with a faceplate that securely holds a direct-connected UniMag II magstripe reader from ID Tech. A blank faceplate can be ordered for installations where card swipes are not required. Merchants can begin placing pre-orders through MobileBytes authorized resellers today. The first wave of Slate stands will be delivered in early April. Overnight shipping will be possible for future orders. 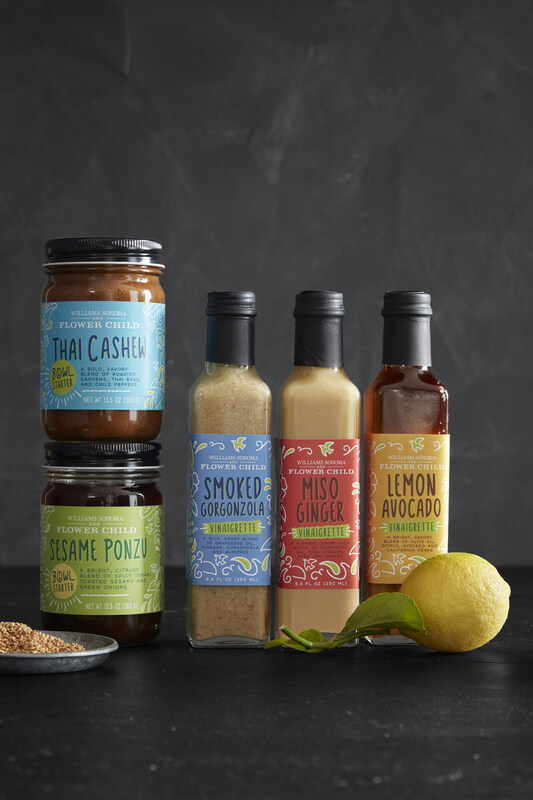 Williams Sonoma launched a line of healthy grain bowl starters and vinaigrettes in collaboration with Sam Fox, the creative visionary behind one of the most successful restaurant groups in the U.S., Fox Restaurant Concepts, which includes healthy fast-casual concept Flower Child. At Flower Child, wholesome and delicious dishes are inspired by one simple mission: “To serve healthy food for a happy world.” The grain bowl starters and salad vinaigrettes allow home cooks to easily recreate Flower Child’s popular dishes in the comfort of their own kitchens. Simply add cooked whole grains, plus sautéed chicken, salmon, steak or tofu to bowl starters for a nourishing, satisfying meal or toss the dressings with leafy greens and farmer market vegetables. Flower Child Smoked Gorgonzola Vinaigrette: A rich, smoky blend of grapeseed oil, vinegar, gorgonzola and almonds. Toss with leafy greens and vegetables. Flower Child Lemon Avocado Vinaigrette: A bright, savory blend of olive oil, citrus, avocado and California herbs. Toss with leafy greens and vegetables. Flower Child Miso Ginger Vinaigrette: A vibrant, umami-rich blend of grapeseed oil, rice vinegar, miso and ginger. Toss with leafy greens and vegetables. Flower Child Sesame Ponzu Bowl Starter: A bright, citrusy blend of spicy tamari, toasted sesame and green onions. Toss with cooked rice and blanched vegetables, and then sprinkle with toasted sesame seeds and add cooked shrimp, beef, chicken or tofu. Also great stirred into fried rice, drizzled over steamed vegetables or used as a quick marinade for meat. Flower Child Thai Cashew Bowl Starter: A bold, savory blend of roasted cashews, Thai basil and chili peppers. Sauté zucchini, blanched sugar-snap peas, chopped celery, onion and jalapeño. Add cooked quinoa, toss with starter, and add cooked shrimp, beef, chicken or tofu, and garnish with fresh herbs. ServiceChannel introduced enhancements to its Asset Manager capabilities, to provide increased visibility into the details of all physical assets, including work history and maintenance, warranty, and preventive maintenance information. ServiceChannel utilizes new Asset Tagging and management technologies in this solution, which helps the company to extend its Service Automation suite, and further accelerates the transformation of the multi-billion dollar facilities and contractor management market to a more modern, data-driven and automated approach. Harvest Creations introduced Dipt’n Dusted® Fried Green Tomato Halves! Made from thick, hand-cut half slices of tart green tomatoes and tossed in our signature coating of seasoned flour and cornmeal, these southern-inspired treats are bursting with bright flavor. Did you know that nearly 40 percent of patrons order appetizers and about 30 percent order small plates on all or most of their restaurant visits?1 This coupled with the fact that fried green tomatoes have grown 24 percent on menus in the last four years2 could mean big profit potential for operators who menu fried green tomatoes. 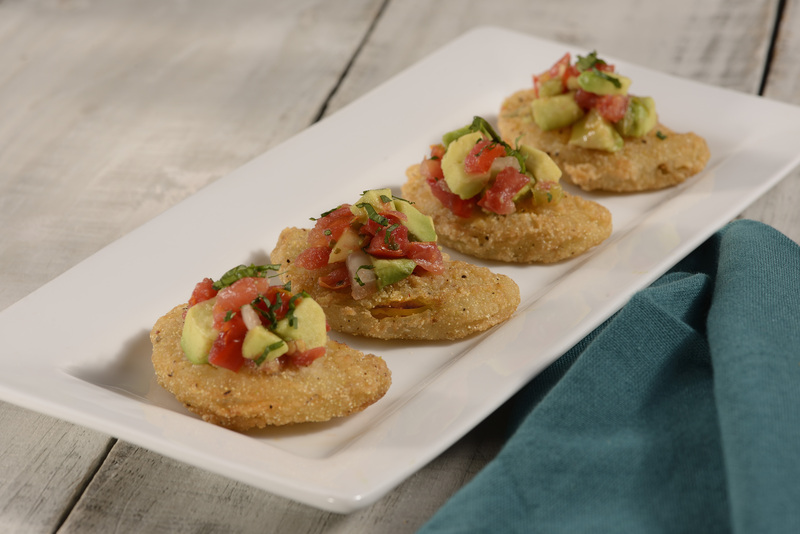 The convenience and versatility of Dipt’n Dusted® Fried Green Tomato Halves allow you to easily tap into the growing demand for appetizers and small plates. The Fried Green Tomato Halves are made with tomatoes harvested & processed in the U.S., and breaded with the Tampa Maid proprietary Dipt’n Dusted® coating system that creates the perfect crunch in every bite. With back-of-the-house, made-from-scratch appearance & taste, the Tomato Halves arrive frozen in 6 convenient, 2-lb. bags for added convenience. Your customers will never know you didn’t spend the time cleaning, cutting and breading these delicious treats. Try your first case on the house—visit http://deals.tampamaid.com/fried-green-tomato-halves from now until September 30, 2018 to redeem one free case of Harvest Creations® Fried Green Tomato Halves. 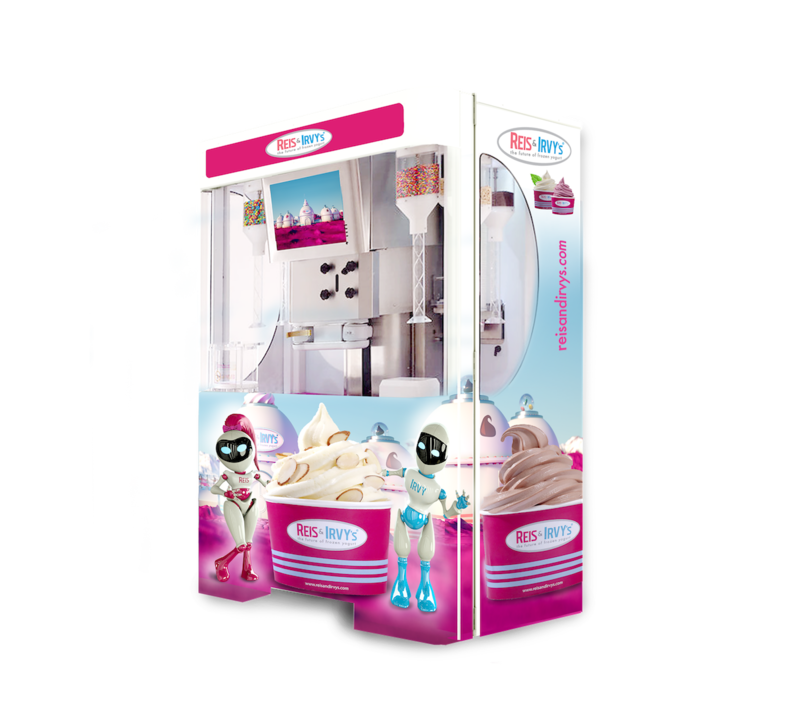 Reis & Irvy’s a subsidiary franchise concept of Generation NEXT Franchise Brands, Inc. said the world’s first frozen yogurt robots will arrive at select grocery retailers in 16 US states this spring. The Reis & Irvy’s Frozen Yogurt Robots provide a fun and delicious experience to the shopper while grocery stores can enjoy a convenient revenue generating addition to their location. Savvy grocers recognize the value of front-of-store services like Reis & Irvy’s frozen yogurt robots, offering shoppers a unique service while saving precious floor space. The patented technology, manufactured by Flex, Ltd- the maker of popular fourth-wall vending machines like RedBox will feature delicious frozen yogurt consumables exclusively from yogurt industry leader Dannon. Generation NEXT’s strategic operations partner, Pitney Bowes will handle all deliveries and installation of the Reis & Irvy’s Frozen Yogurt Robots. Reis & Irvy’s is dedicated to finding the FroYo Robots homes in high traffic locations including grocery stores, markets and retailers across the country. The April deliveries and installations signify the beginning of an aggressive rollout strategy. As part of the initial rollout, the Company anticipates shipping approximately 185 units in May and 250 units in June. Cocktail Artist® celebrates its one-year anniversary this month with the release of seven new products, crafted by award-winning mixologists from across America and the Bahamas. After a year of driving growth in the cocktail mix category at one of the nation’s largest retailers, the Cocktail Artist family now touts 15 products, including category mainstays Margarita Mix and Bloody Mary Mix, available nationwide. 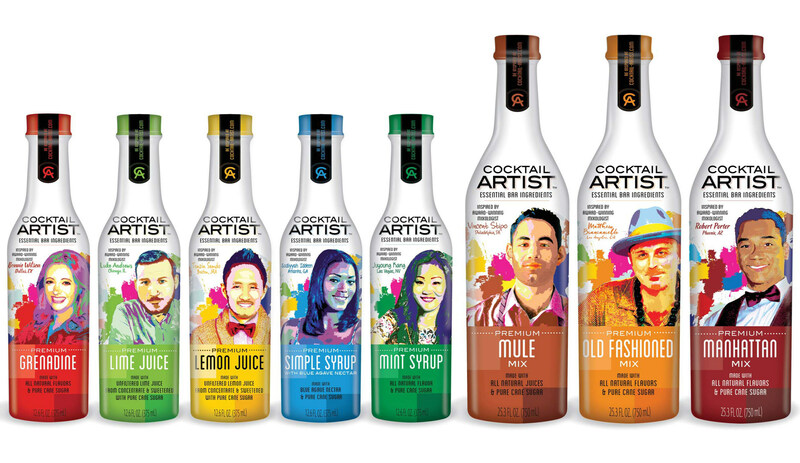 Cocktail Artist launched nationwide in March 2017 in Walmart stores, and will soon be available in supermarket chains across the country. Shortly after hitting shelves, Cocktail Artist contributed more dollar sales growth to the cocktail mix category than any other existing brand sold at Walmart (Nielsen Answers POS, December 2017). 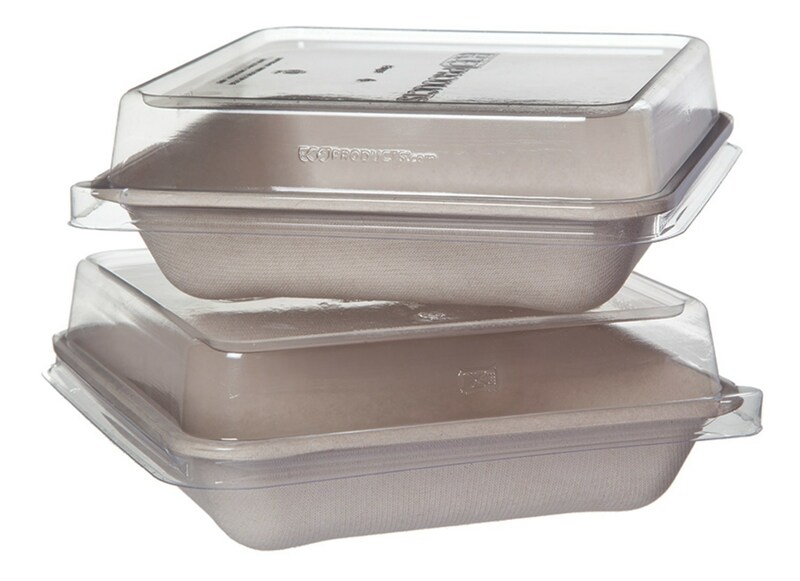 Eco-Products is launching new line of compostable takeout containers that are unmistakably and undeniably natural. The bases of the new containers come in a natural bagasse color and are made from 100 percent renewable sugarcane fiber. Named WorldView™ Naturals, the new line is strong, durable and versatile. Paris Site Furnishings introduces the Premier series backed and backless benches which provide comfortable seating with a contemporary look, making it ideal for interior or exterior installations. Available in four- or six-foot lengths, each steel, powder coated bench features a vandal-resistant design in straight, curved or circular configurations. These one-piece, ready to install benches are available in standard colors including red, blue, white, grey, green, yellow and beige, with custom colors available as an option. They are ideal for parks, streetscapes, green spaces, schools and universities, sports venues, transit facilities, retail and corporate settings, restaurants, hotels, hospitality venues and wherever comfortable, durable seating is desired. Premier series benches are manufactured of ¼” mild steel so they are strong and durable. They are then rust-proofed and powder coated to withstand the elements. Built in-anchor holes allow secure mounting to a solid surface like concrete. Manufactured in Princeton, ON and available factory direct or through distributors and dealers throughout North America. Paris Site Furnishings and Outdoor Fitness manufactures a range of aesthetically pleasing, comfortable, functional and durable site furnishings. 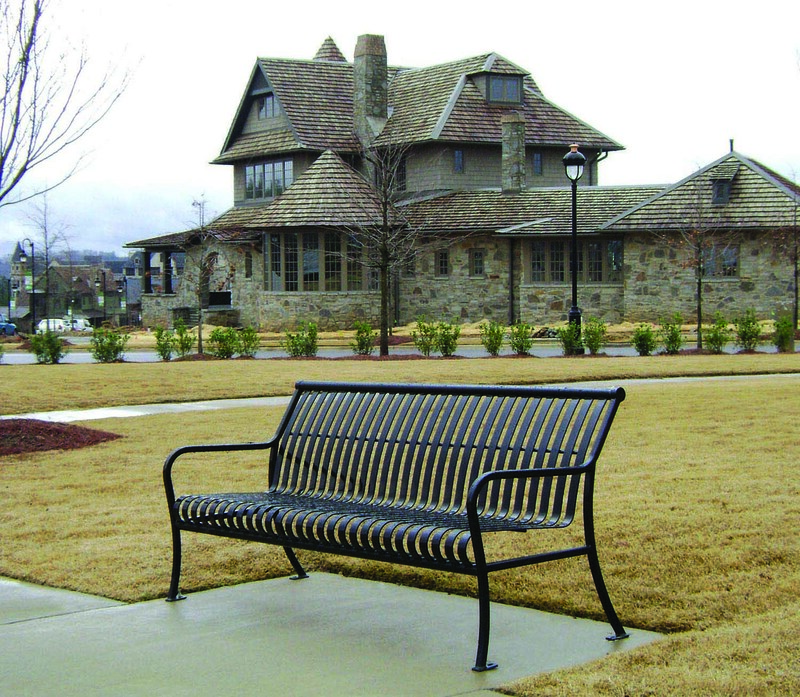 Their benches, waste and recycling receptacles, picnic tables, shade structures, planters, bollards, and bike racks, are available in varied materials including steel, hardwood, aluminum, and recycled plastic. Parterre Flooring Systems introduced Studio Luxury Vinyl, a new accent collection featuring two luxury vinyl flooring designs—Tela and Colour. Available in 28 colors, options range from a muted palette of gray tones and expressive hue variations to vibrant splashes of color. 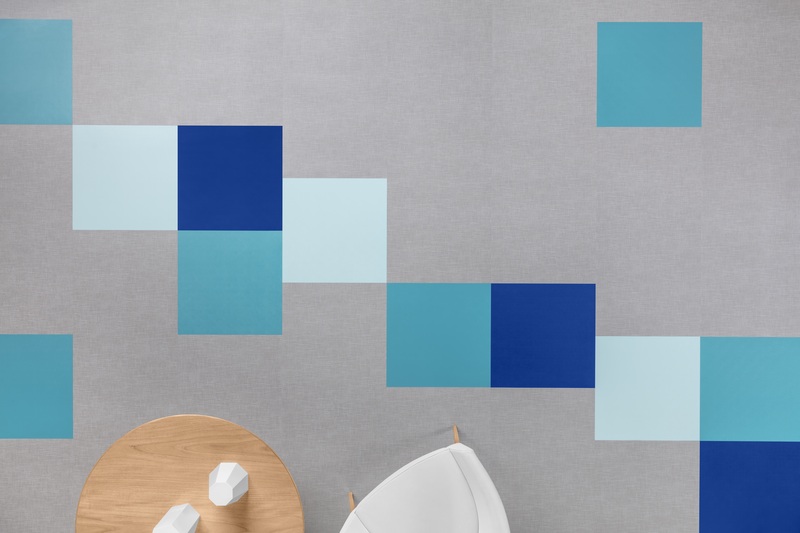 Inspired by the assets used in an artist’s studio, Tela’s 10 colors have a woven-like design and authentic texture that offers a neutral canvas for interior spaces as both stand-alone installations and flooring accents. Studio’s second design, Colour, has 18 hued accent options also named with artistry in mind.Versatile for any commercial application, Tela and Colour are both designed to work as flooring accents, ideally paired with Parterre’s current running line of 3mm luxury vinyl tile and plank products. Both offered in a tile format, Studio’s Tela is 18” x 36” x 3mm in size and Colour is 18” x 18” x 3mm. Available in a commercial construction, products in the Studio Luxury Vinyl collection are FloorScore certified and have the quality of craftsmanship that Parterre is known for. Utilizing hot press technology, Studio Luxury Vinyl has a sturdy construction with its multiple layers of backing that are fused together to create a tighter bond for a more stable product all around. Like all of Parterre’s luxury vinyl products, Studio flooring features an ultra-clear, high-performance wear layer that is easy to maintain and has a resistance to staining and scuffing.